BindingStandard Tuckett binding, mid 19th century full brown calf over thick wooden boards (Charles Tuckett, binder to the British Museum, rebound many Durham manuscripts in the 19th century). The first flyleaf (f.1) bears traces of turnovers from an earlier binding. Creator notes:Possibly a single scribe. Script:Textualis precissa for the biblical text; Textualis semi-quadrata for the commentary – grand but not scrupulously even, and declining slightly in regularity after the first two quires. Very occasional calligraphic extension of descenders in the bottom line (e.g. 210v, 211r, 307r). 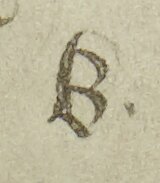 Historiated or decorated initials, up to 48 lines high, mark the general preface, and the incipit of each biblical book (that for II Timothy has been excised). The work of a single artist, they are constructed from coloured bars (occasionally with interlacing twists), their bowls ornamented with foliate tendrils and ebulliant leaf-bursts, their smaller spaces filled with coloured foliate motifs, set against burnished golden grounds within coloured panels. Linen covers over most letters.